By reading Nibley, the gospel became a very real thing to me, and gave a climate in which my faith grew and flourished beyond what I thought was possible. It was like seeing the words on a page suddenly spring to life. The gospel became not only a spiritual mode of living, or a moral code, but Nibley gave a real place for it in the larger worldview of history, literature, economics, culture, languages, peoples, religions, morality, and theology. He brought everything together, and made connections no one else had. He gave a much deeper purpose and meaning to the gospel which I hadn’t found elsewhere, teaching me in ways I hadn’t encountered before of the true reasons for the Atonement of Jesus Christ, and His gospel. Nibley heightened my awareness of myself, and gave me grander views of life, what it means to seek after true joy, and the purposes for which we’re all here. In a sense, Nibley brought me out of Plato’s cave. FARMS became synonymous with Hugh Nibley throughout the 80’s and 90’s. I remember on my mission in El Salvador hearing through the grapevine about a book by none other than one Hugh Nibley entitled something like The Egyptian Endowment, and some of what it contained, and it absolutely fascinated me. I was floored that such a book could even be written! Did the Egyptians have a ceremony and ritual similar to our modern day temple rites? And if so, what an amazing vindication of the prophet Joseph Smith! These ordinances really are “as old as the human race”! It peaked my interest for along time, since I did not have access to such materials on my mission, and oh how I longed for the day when I would be able to read it when I returned home. Indeed, when I returned home from my mission, I went immediately to work tracking down that book. It was out of print, and I’m sure I could have picked it up somewhere for a few hundred dollars, but I heard rumors that the Second Edition of the book was being prepared for publication by the Maxwell Institute (at that time it was known as ISPART, for the Study and Preservation of Ancient Religious Texts). So the waiting began anew! I waited for three more long years until the The Message of the Joseph Smith Papyri: An Egyptian Endowment (2nd edition) was published by Deseret Book. It was Christmas morning for me (which is quite accurate since it was published on December 30, 2005), and I was a schoolboy all over again. I devoured that book. Well, let me rephrase that. I placed my pinky toe into the deep end, and did my best to pick it apart. I was excited beyond belief to read about the rituals of the Egyptians, about their coronation rituals, their mummification rituals, their cleansing and purifying rituals, and afterlife rituals. It opened up my understanding of the temple to levels I thought not possible. I still return quite frequently to that book, and glean amazing insights and knowledge from its pages. And I still haven’t finished reading it! Of course, along with all my excitement about the Egyptian Endowment, I began looking into this prodigious figure by the name of Hugh Nibley down at “the BYU.” I found that he had become one of the Church’s most prolific scholars and defenders of the gospel. I started picking up his other books and writings, such as Brother Brigham Young Challenges the Saints, and I ate it up. This was a whole new world of scholarship and becoming acutely aware of and understanding the gospel of Jesus Christ. I love that man. I love him. As deeply as I love my best friends. And I never had the chance to tell him so, I never had it. I bemoan that to this very day. The closest I ever came to him was attending his funeral in the de Jong Concert Hall, with video broadcast from the Provo Tabernacle. With heartfelt emotion, I look forward to the day when I can walk up to Hugh Winder Nibley, shake his hand and give him a hug, and with tears in my eyes thank him for everything he has done, for me, in facilitating my lifelong conversion to our Savior Jesus Christ, and His eternal gospel and the kingdom of God on the earth. “And if it so be that you should labor all your days… and bring, save it be one soul unto me, how great shall be your joy with him in the kingdom of my Father!” (D&C 18:15). What a celebration that will be! My emotions have been very close to the surface these last few weeks with everything that happened to the FARMS component of the Maxwell Institute. It ripped me at my core to see this organization dry up and vanish, forcefully so, seemingly in an instant. It shocked me to think that some thought the Church didn’t have a need for this kind of scholarship, which had done so much for me, and so many others. Where would I have been without FARMS and Hugh Nibley? I honestly don’t know, and I fear just thinking of the vision. There have been several times over the past few weeks when I’ve honestly wept tears of sorrow over what’s happened. A couple of those times, as silly as it might sound, were when I heard a couple songs on the radio, and my emotion spilled over. Go ahead and laugh. I did! Of course, a friend and I didn’t just want to sit around, we wanted to do something about it, and hence we started the Restore FARMS support movement, with a website at RestoreFARMS.com. We wanted to show our support, and gather others who also showed their support for traditional FARMS. What is likely to be profound for some is that we are young; I’m in my early thirties, and I believe Tevya Washburn is too. We have young families. We are Generation Y, born of baby boomers. We did not grow up with Nibley, per se, or were involved in the golden days of FARMS in the 80’s and 90’s. Yet we were fundamentally moved by the work it produced, when we discovered it at a later date, and desired deeply to see it continue on in some form. And now for the reason you’re reading this post in the first place, if I’ve teased you long enough. Early last week I was approached by William Hamblin (whom I’m friends with) and Daniel Peterson (who I haven’t met personally before) early last week. They wanted to do something too. I couldn’t have been happier to hear it. Once more, they wanted my help to make it happen. Me. Disbelief. Can I just say that I’m unsure I’ve ever received a greater honor in my lifetime. These great scholars, who have dedicated the better portion of their lifetimes sustaining and defending the Church and its gospel, and whom I’ve privately admired from a distance as filling the vacuum and vacancy left by Nibley’s passing, were coming to me, looking for my help, to help an organization that I dearly loved and wanted to live on. Words can’t express the thoughts and emotions. I was deeply, fundamentally moved, and still am. They asked for my help to put together a website and the technological solutions for a new journal that would serve much the same purposes that the FARMS Review had in the past, and the Mormon Studies Review in more recent days. And they wanted to do it fast too. Since Br. Peterson had just returned from his trip out of the country and things hadn’t been moving forward on any fronts elsewhere, they wanted to see if it could be ready to go by the 2012 FAIR Conference, on August 3rd, if possible. That conference, if my scheduling this blog post goes as planned (since I’m writing this on Wednesday evening, August 1st), is just now coming to an end, and Daniel C. Peterson has just concluded his remarks as the final speaker. At the end of his remarks it was his opportunity, as former editor of the FARMS Review for 23 years, to take the center stage and announce this new venture, as a new age in Mormon apologetics is revealed, and we move forward into the 21st century of technology and scholarship in the Church. How exquisitely humbled I am that I had the opportunity to be a part of this historic occasion. Interpreter: A Journal of Mormon Scripture is a nonprofit educational journal focused on the scriptures of The Church of Jesus Christ of Latter-day Saints: the Book of Mormon, the Pearl of Great Price, the Bible, Doctrine and Covenants, and related subjects. All publications are peer-reviewed and are made available as free internet downloads or through at-cost print-on-demand services. Our goal is to increase understanding of scripture through careful scholarly investigation and analysis of the insights provided by a wide range of ancillary disciplines, including language, history, archaeology, literature, culture, ethnohistory, art, geography, law, politics, philosophy, etc. We hope to illuminate, by study and faith, the eternal spiritual message of the scriptures—that Jesus is the Christ. Although the editors of the journal fully support the goals and teachings of the Church, the journal is an independent entity with no affiliation with The Church of Jesus Christ of Latter-day Saints, nor with Brigham Young University. The Board of Editors is alone responsible for its contents. I had quite a task before me, to understate. I was asked to build the mechanism that would help serve this great mission. I do find it providential the circumstances that have come together in recent years, months, and days to bring me to this point where I could be in a position to help in this way. I was invited to come to a meeting last week, on Thursday, July 26th, to meet with the Board of Editors. The hyperbole is probably becoming excessive by now, but what an opportunity! Here I was, an amateur, sitting with seasoned veterans, people I’ve admired for a long time, and who have written dozens of books, with alphabets suffixed to their names, and I counseled with them about the best way to go about launching this new publication. I’ll never forget it. I went to work that same day, last Thursday, July 26th, to begin building what would become MormonInterpreter.com. What you see today, August 3rd, are the results of that eight day effort, with some amazing guidance and collaboration and work by many on the entire Board of the new journal (which I was invited early on to join), including Alison Coutts who worked tirelessly to edit and typeset the inaugural paper by David Bokovoy. My brother also worked, sometimes into the early morning hours, on the website server and hosting technologies behind the scenes. We actually had a significant server bug which was a severe technological problem that we didn’t solve until late Monday night, July 30th, and into the early morning hours of Tuesday. This problem prevented many of the most important development on the site until it could be resolved, which I credit wholly to my fantastic and beloved brother, Brad Haymond, for finally finding the solution after many hours of picking through source code line by line and talking with technical support reps. Thank you, Brad, for being patient with me. Because of this troubling hangup, which very well could be attributed to an antagonist from the unseen world trying to put the brakes on this work, I wasn’t able to get to the majority of the work until about 1:00am Tuesday morning, July 31st. I’ve worked almost nonstop since that very time on the clock, almost 43 hours ago, to finalize the Interpreter website and technologies by this morning, Wednesday, August 1st. I haven’t gone to sleep, at all, of my own free will and choice. I have consecrated my everything to help this be the absolute best it could possibly be by today’s announcement. And I couldn’t be more proud of what we’ve been able to accomplish. I have been immensely blessed and sustained in body and spirit these last couple days to finish this, for which I am supremely grateful to our Father in Heaven (D&C 84:33; D&C 89:18–21). You could say we had our own “First Vision” experience, when the mists of darkness suddenly cleared, and we saw the light. Providence prevailed, as it always does in the end (D&C 18:5). Great lengths were taken to make the text on the website mirror the look of the printed journal as much as possible, up to and including the fonts used. This was to keep the professional feel throughout, and consistency between mediums. We have short biographies and photographs of all the Board of Editors, on which I have also been invited to be a part. Take a look. We’ve applied a Creative Commons license to the website and the journal, with no derivative works, nor commercial use allowed. But the materials can be shared as widely and freely as possible with attribution. This is known as a CC BY-NC-ND license. There are 9 different ways of subscribing to our publications (see along the top edge of the site). This is more than I’ve seen at most other websites, and should give readers and supporters plenty of opportunity to “follow” us in whatever venue suits them best, including email, RSS, Google+, Facebook, Twitter, Audio podcast, PDF podcast, ePub podcast, and printed copy feeds (for easy ordering of a hard copies). The three podcast feeds will soon be listed in Apple’s iTunes podcast directory, for ease of access on your Apple iDevices. We also have 7 different formats of offering the scholarly papers for download – HTML (what you see on the site, which can be easily printed from your browser), PDF format, ePub format (works on most e-readers including iPad, Barnes & Noble’s Nook, etc. ), Amazon’s Kindle .mobi format, and MP3 audio reading (thanks to my brother Brad, again, for offering his great voice). A How-To page on the site describes the best ways of using these formats and feeds. If you’d like to print out a copy, you can do that directly from the webpage, and it will print out a cleanly formatted copy from your printer. We are also including an option for ordering a bound printed copy, for those who don’t like to read on screens, directly from an innovative service called MagCloud. Think of it as printing “in the cloud.” This service from Hewlett-Packard takes care of all inventory, printing, binding, shipping addresses, ordering, processing, taking payments (for cost of printing), and shipping worldwide, so we don’t have to! This will help tremendously to keep costs associated with our operations to a minimum. MagCloud will print as few as just 1 copy at a time, and ship it direct to your doorstep. Each of the journal’s papers will be available for about $4-5/each (including shipping), covering cost only (we are a nonprofit). Later, once we have accumulated several papers, we will make it available in a bound volume too, which will be available for ordering the same way. The footnotes are all hyperlinked in the papers, so you can click on the superscript number, and it will jump directly to that footnote. Then you can click on the return arrow at the end of the footnote, and it will return you right back where you left off in the paper. Don’t you love technology?! Where was this back in the days we read Nibley? Because we are a nonprofit organization, yet we have operations that cost money, we have provided the option of making donations simply through PayPal. We are preparing for 501(c)(3) nonprofit status, which we hope to achieve at a later date. Donations now are non-tax deductible. All the biographies of our editors and authors will be linked to lists of the papers written by those scholars. The website is completely mobile-ready, and displays very nicely on iPads, iPhones, Androids, and other smartphones and tablets, for reading on-the-go. We will be able to track in a very precise way all the traffic that the website gets, down to the number of times each format is downloaded, and the number of subscribers we have on each feed, to better fine-tune our offerings. There is a News page that will include site announcements, news, blog posts, etc. that are separate from the scholarly papers that are front and center on the homepage. There is full search capability throughout the site, accessible from the navigation bar, on the right edge. 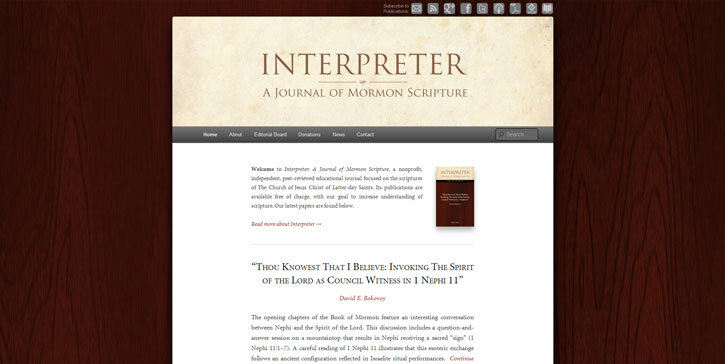 We also have the InterpreterJournal.com domain name, which just redirects to MormonInterpreter.com, but just in case it’s easier for some to remember. This has been a chance of a lifetime to work with these scholars in putting this together, and a work that is some of the finest I’ve ever accomplished. No, I consider it the finest work of my professional career thus far, all done without any pay. I wouldn’t have had it any other way. My best work, I’ve found, is done by consecration. The entire Board of Editors is very excited for this launch, and we are really looking forward to what we will be able to do going forward. It’s going to be a whole new world, a new stage in life, appropriately given a “new name,” which I think Hugh Nibley would appreciate, if he were here today. At this point, I’d like to take special note that David Bokovoy’s inaugural article about 1 Nephi 11 is 100% related to the temple. In all my formatting, and exporting, and tweaking, and wrangling of the text, I haven’t actually been able to sit down and read it thoroughly yet, but I believe we will find some very good insights in there from a temple perspective. Thank you David! Perhaps a future post will be a review of this article, and some things that stood out to me. That’s all for now. Thank you again, my colleagues on the Interpreter Board of Editors, William Hamblin, and Daniel Peterson, for this one-of-a-kind opportunity to be a part. I am also, once again and forever, thankful to our Father in Heaven, for the confidence He has in me. I now need to go home to my wife, who has been so patient with me through this time of tremendous focus, eat dinner, relax while watching our U.S. Olympic swimmers win some gold medals, and finally get a good night’s sleep. All is well, brothers and sisters. All is well! I have to admit, I’m very jealous that I wasn’t included. But otherwise this is very exciting news. I have many ideas for great papers, and depending on the acceptance of my manuscript, I might be able to offer a great deal of material to Interpreter very soon. I did have an idea for a series. I thought since this is a new FARMS perhaps they, (I almost put “we” because I feel that invested), could do a series of articles that were inspired by the old FARMS material. For instance, I have several papers that were directly inspired by Hugh Nibley, and several others chapters from other FARMS material. I’m sure I’m not the only one that can say the same. Since this is a symbolic changing of the guard it might make a good special collection or edition. Dr. Peterson’s talk this afternoon was great. We hope that there will be some impact on the situation that has been created by the “new hires”. Hi Morgan! One of the goals of this new journal is that it will try to encompass the writings of many many scholars. Get in touch with Daniel Peterson, and we may very well see some of those papers in the Interpreter journal! For all of us who have appreciated the work of FARMS and MI for many years, we thank you for your talent and sacrifice. I expect it will be a gift that bears delicious fruit. Congrats, Bryce! Being the “baby” on the new board, means we are training the next generation to take over. We are in good hands. Very nice set up for the Mormon Interpreter. Nice work done very quickly. Two things for the Interpreter site: Kindle Mobi is not showing as a link at the top right. You should have a link to info on how to submit a paper. Requirements for the paper, and contact/place to submit info should be readily available….or should it? When I have time, I may have to consider preparing a paper. There are a few things I’ve been pondering that may work for a paper. Thank you very much all! I really appreciate it. Rameumptom, the Kindle Mobi format is not available as a podcast or feed, that is why it doesn’t show at the top-right (the top-right list is just for subscriptions and feeds). Mobi is only available as a stand-alone download from the right-hand side of each article. It is available (or will be soon) from the Kindle Store as a “Kindle Blog,” that you can search for and subscribe to automatically receive updates wirelessly over Whispernet. You can read more about all of the formats and feeds. I will ask the Board about submissions. I’m unsure they want to do that at this point (they have a lot of papers already stacked ready to go!). I suspect if we do that, it will be through the contact form. All I can say is “Wahoo!” So happy to hear all of this. I have only one question at this time — is there going to be a printing of the papers from the VERY recent 2012 FAIR Conference??? This is awesome! I have a PhD in Physics not ancient scripture or more relevant fields like that so I never know how to contribute to Mormon Studies… But if I could ever figure out something to contribute one day “This is the place” I would like to. And in the mean time I am very excited to read. Congratulations on this wonderful new venture. May it be the start of many good things. From one from the FARMS golden years I want to say “Well done”! I am positive that Brother Nibley is pleased. Blessings on all you do. Are there plans to use any of the unpublished FARMS review articles? What about the controversial Mormon Stories article? Dan Peterson noted in the Q&A that there are no plans for that article right now. Greg Smith has it in his hands. I look forward to seeing what is published. Bryce, could you look at how the site renders on mobile devices? It is difficult to navigate on my iPhone. John, a “mobile version” of the site should come up automatically on your iPhone. It does on mine, but I’ve had others report the same issue as you, so I’m looking into the issue. Thanks for reporting it! I’ve been able to duplicate the issue on my phone now. I’ll get it solved as soon as possible. Ok, I think I got the mobile version under control. Please check it, and let me know if it is working for you. Bryce, God bless you for the work you’ve put into this. It’s good to see my generation stepping up and continuing along the way set by so many before us. Your testimony and efforts don’t go unnoticed. As someone who often insists on hard copies, I appreciate the Journal using MagCloud. Will the papers ever be compiled into numbered volumes available for subscription? It would be nice to simply receive them in the mail once enough papers have gone through, or to receive a new volume automatically every few months or so, per the subscription. Is there any potential of that happening? I will ask MagCloud about the subscription model. It seems like that would be a natural feature of a magazine print-on-demand service. Though Bryce may be gushing here about a few things, and thinks he is a novice, many of you who read this blog/site will know he has a significant amount of knowledge in his head, especially about temples. But I also think he is being a bit humble. He is the smartest person I know, and one of the hardest working (if you can’t tell), especially when he has a passion for something. As you can see, he has a passion for this, so watch out! Not only did he create all the technology behind the new site, he also is responsible for the graphical look and feel and all the CSS, templates, and themes of the website. I’m not sure the adversary was causing the server bugs we encountered, but I’m glad we were able to fix the initial system problems. I actually do feel like I was inspired to find the obscure, VERY strange bug in my server, after spending several hours with the web hosting company scratching their heads with me over it. We all will work to make this new site the best! I now get to the mobile version by default. Much more legible. May I suggest that you would want the “normal” version of the site to render in a way that is usable on mobile as well? It looks very nice on my laptop. Congratulations, Bryce. I can’t think of a man more fit for the work. Excellent choice. I agree that with the right programming the full site could be rendered to fit with mobile which would look much more attractive and professional. Thanks everyone. I agree the mobile version can look better. We will be working on all aspects of the journal’s design and features going forward, to make them the absolute best. If I may offer up a suggestion. What is the chance to have the authors themselves do the audio for the podcasts? That’s a great question, David. Larger publishing companies may have the resources to do this, which is great. The logistical challenges may not make it feasible for Interpreter in the short term as we get going. That said, if authors wish to do their own recordings, and they have the means to do it without too much trouble, they may, so we may have a mix. Nice use of WordPress and the Twenty Eleven theme. Good to see this site go live after the hubbub with FARMS. The journal looks great. I wonder if this is the first journal to exist with a purpose to bring scholarship into the 21st Century via mobile and web accessibility. The hyperlinks are pretty amazing as well. I’m very excited for how this will go. Also, you can charge more than cost for printing the journals. Non-profits need to pay staff and the government understands that. I hope this is just a beginning for you. I hope the day will come when you will be engaged in this kind of work full-time. This is a worthy labor and surely the laborer is worthy of his hire. I couldn’t be happier. I am only a few years older than you Bryce, but have been a fan of FARMS since I returned home from my mission too. I still have a collection of many FARMS papers, which used to be sold stapled together and shrink wrapped at the BYU Bookstore and at Deseret Book. I’ve also got several leather bound and other volumes, which I consider by far some of my “best books”. I’ve chaired 2 BYU alumni chapters (DC and SLC) and I always tried to schedule FARMS people to come speak. We had Dan present to some middle-eastern ambassadors at a packed DC Temple Visitor’s Center once. I would LOVE to be involved somehow. Tell Dan I said “hello”. PS – I only recently became more endeared to the genius of Bro. Nibley. I read “The World and the Prophets” and “Nibley on the Temple, himself, and others” in the last 12 months. Both were amazing, and you can get them for free at the Maxwell Institute. I am new to sites promoting LDS beliefs and apologetics. I don’t mean to rehash. I have read the apologetics of other religions and their style of answering, commenting, discussing, etc. is no different than what Dan Peterson and the others at FARMS did. The critics and enemies of the church and the work of Dan Peterson et al aren’t interested in true apologetics. Bryce – Congratulations. I haven’t been able to follow recent happenings at FARMS/Maxwell Institute since I’ve been out of town on business and then on vacation, but you are involved in a very important endeavor. If there is anything I can do to help, please let me know. Thanks.